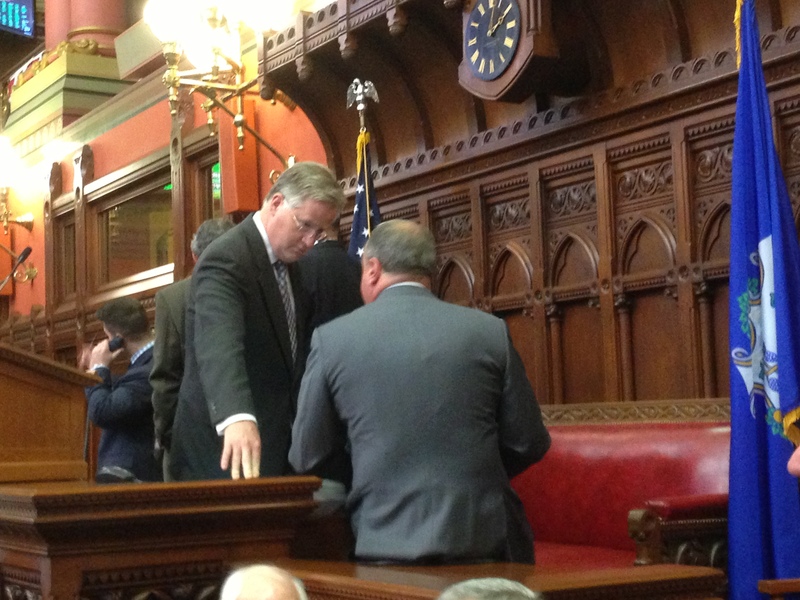 House Speaker J. Brendan Sharkey talking to House GOP Leader Lawrence F. Cafero Jr. before Cafero addressed the House. It was a stunningly swift cycle of gaffe, controversy and apology in the Internet age: An adjunct professor insults Republicans on Monday, only to find his words recorded and posted online, drawing a denunciation from the floor of the state House of Representatives on Tuesday. Just an hour after he was denounced by the House GOP leader, Brent Terry apologized for critical comments he made about Republicans and conservatives during a creative writing class at Eastern Connecticut State University, where he warned that a GOP takeover of the U.S. Senate could threaten universities such as Eastern. “During my creative writing class yesterday, I allowed my own political opinions to color the discussion. I regret the language I used, and I apologize to any students in the room who were offended,” Terry said in a statement distributed by the school. “As a liberal arts university, Eastern is known for encouraging debate and discussion about a host of social and political issues. A four-minute audio of Terry’s comments, presumably made secretly by a student, were posted on a website Tuesday. The audio begins in midsentence, Terry referring to “racist, misogynist, money-grubbing people” who do not want blacks, Latinos, the old or the young to vote. “There are a lot of people out there that do not want black people to vote, do not want Latinos to vote. Do not want old people to vote, or young people to vote. Because generally, people like you are liberal,” he says on the audio. Cafero spoke about Terry as a point of personal privilege with the permission of the House Democratic majority. He was applauded from both sides of the aisle after he spoke. “I am a firm believer in academic freedom. I am a firm believer that professors should have that freedom to express their views to their students,” Cafero said. But Terry’s comments to the students in a creative writing class crossed a line, he said. “I find it offensive as a Republican, as a parent and frankly as a citizen of the state of Connecticut that we would have in our public university a professor who would make such a comment,” Cafero said. Elsa Nunez, the president of the university, said after listening to the audio that she tended to agree.